He said the driver was not following traffic rules but that he chose not to raise his concerns because the bus crew would have beaten him up. He described the bus crew as "very arrogant". The government agency in charge of road safety said the bus did not have a license to travel at night. 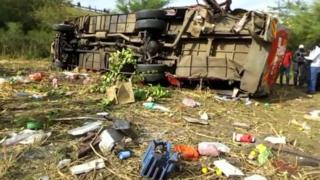 The accident happened at 05:00 local time (02:00 GMT) in Fort Ternan town, 80km (50 miles) away from Kisumu, local media reported. An eyewitness described hearing "a long hooting sound, then a screech that was followed by a bang and loud screams," the Daily Nation reported. A number of people were taken to hospital, it said. Kenyan roads can be notoriously dangerous and the World Health Organization (WHO) has ranked Kenya as one of the world's worst countries for road safety. In the past 10 months, 2,345 people have been killed in road crashes across the country, an 8% increase compared with last year, the BBC's Wanyama Chebusiri in Nairobi, reports. Claims of police taking bribes from traffic offenders have also contributed to road accidents in the country, our reporter adds.